Hi guys, I have been having problems in getting my 2 speed wiper & washer to operate correctly. I bought it used from California Corvairs. I got it pretty well sorted out but the washer wouldn't stop pumping. In both speeds. I kept fiddling around with it & now, it runs at both speeds and the washer runs when prompted ( by the switch) does its cycle, then stops its pumping duties. Except now, it wont pump any fluid. I've tried to prime it several different ways & it just won't pump. I tried to disassemble it but can not get the gear off to access the diaphram. Clarks sells a valve kit and a new pump but not a diaphram. I'm stumped. Any one have ideas ? 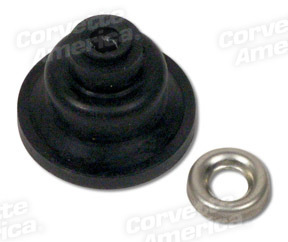 In the event you need the rubber part as shown in the attached picture, they are available from some of the Corvette vendors like Corvette America, and Corvette Specialties. Look at the mid year car listings (1963-1967). They also sell rebuild kits I think, just in case the Corvair vendors don't. Edited 1 time(s). Last edit at 02/07/2019 05:27PM by Caraholic4life.